In four short years, SXSWedu in Austin has established itself as perhaps the most influential education conference in the world. More than 6,000 educators, school administrators and ed-tech entrepreneurs gather to compare best practices, to try out new ed-tech software and hardware, and to debate the changes taking place in education in America, from preschool through college. 1. America must figure out why its college completion rates are so low and develop strategies for improving student success. Second Lady Dr. Jill Biden speaks frequently on community college issues, and her keynote focused on why 45 percent of students who start at four-year colleges do not finish within six years (the lowest rate among developed nations). She also discussed access and equity, and the new accountability that is catalyzing change in higher education. 2. Mindsets and the role of a growth mindset in college completion will continue to be a hot topic. Two McKinsey consultants presented their research on some low-cost and high-impact interventions that can move the needle on completion rates. It can be as simple as hearing other students share how they overcame challenges in school. Meanwhile Google recently announced that it is more interested in hiring students who exhibit a “growth mindset” than those with high GPAs. Social, emotional, purposeful learning and mindfulness were also hot topics. 3. There is a growing disconnect between what students learn in college and what skills employers want in new hires. Why are so many jobs going unfilled while so many recent graduates are unemployed? Employability was a hot topic, as was tapping industry to get involved in both high school and college course planning as a means of boosting career readiness. 4. Right now learning is measured largely by seat time (a year in ninth grade, a year in tenth grade, etc. ), but the idea of digital badges (think Boy Scouts) and “credentials” were a hot topic. Some schools now advance students based on competency tests (when you master geometry you move up, no matter what grade you are in). Credentials can also signal achievement and specific knowledge and skills to potential employers (Photoshop, Powerpoint, Java, corporate finance and accounting, etc). The concept is already popular among job seekers switching careers or re-entering the workforce who are investing in new skills. 5. Schools must figure out a way to balance data collection with student privacy. Data is very useful in tracking student progress and boosting college completion rates. Knowing a student’s socio-economic background and parent education levels can help put support in place, but sharing that knowledge and tracking based on a student’s background is controversial. Can innovation and privacy coexist? 6. Technology isn’t going to replace teachers but it can help them be more effective in their jobs. There is no question that technology is here to stay. The ways that it can help teachers to differentiate instruction and make learning more engaging and relevant (adaptive, engaging educational games, for example) were hot topics in almost every session. Will teachers shift from being “content experts” to “curriculum facilitators”? • High Tech High, a high school completely dedicated to project-based learning = Less talking and more doing. The documentary “Most Likely To Succeed” features the school. 8. Districts are increasingly relying on crowd funding and community donations. One keynote speaker was Charles Best, the founder of Donorschoose.com. Since 2000, DonorsChoose has featured projects from 63 percent of all public schools in the country. The site is a new great way for teachers to avoid red tape around procuring edtech tools. DonorsChoose can also calculate the most-requested books or craft material in a particular area, and can share this data with local districts for planning purposes. 9. A maker space and a coding dojo are coming your way. A good balance to the emphasis on technology is the recognition that kids love to use their hands to make things – and that students should create media, just not consume it. Sonoma Valley High and a dozen other schools in Sonoma County have jumped on the bandwagon with actual maker labs where students have tools to create. CoderDojo and Girls Who Code are launching volunteer-led coding clubs for young people across the country. 10. And finally, and most concretely, the physical classroom space is due for a dramatic makeover. Students need to collaborate, teachers need classroom design flexibility and students should not be sitting all day. I saw a fantastic new chair from Steelcase that holds a backpack underneath, swivels and rolls for collaboration and features a pivoting desk that holds a laptop, tablet or iPhone. Also featured were standing desks and whiteboards that served as room dividers. 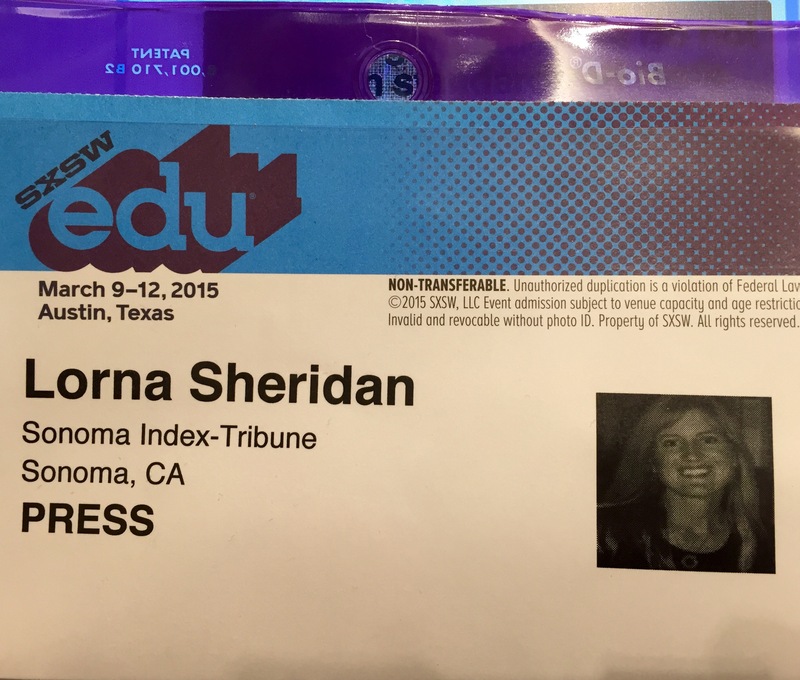 As usual, I left SXSWedu with as many questions as answers. But in each auditorium and breakout room, the audience of education thought leaders seem to agree that the sharing of ideas and debate felt very much like the very best classroom imaginable.